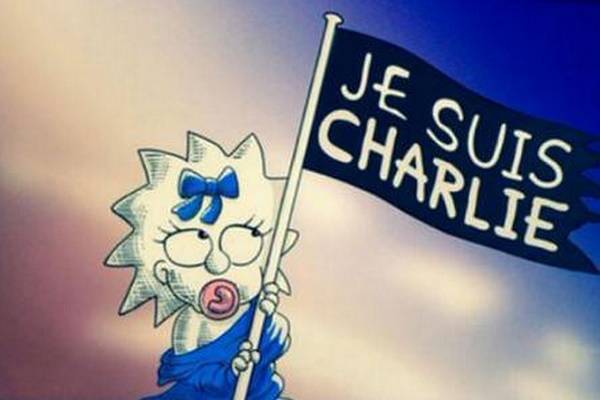 The shot features Maggie standing in as the goddess Liberty, holding a flag with the unifying phrase “Je Suis Charlie” on it, in memory of the cartoonists who lost their lives in a deadly terrorist attack last week at the French satire magazine Charlie Hebdo. It’s a touching tribute from one set of once-offensive cartoonists to another set of often offensive cartoonists. It’s a relatively small world for artists of that nature, and solidarity is almost always a good thing. I’m assuming the shot was so brief as not to impose on Fox’s advertising. Maggie is perhaps a strange choice to be the one holding the flag here, since her freedom of speech, or lack there of, has never been challenged. Or maybe it’s always been challenged, by the very people who created her, since they’re the ones who have limited the majority of her vocal presence to “sucking sounds.” Either way, I would have expected Bart, the cause for much of The Simpsons early-days backlash, to be the one seen here. Remember when “Eat my shorts” was offensive to people? For a little background: on January 7, the Paris headquarters of Charlie Hebdo were invaded by Islamist gunmen and brothers Saïd and Chérif Kouachi, who shot and killed twelve people, including cartoonist and editor-in-chief Stéphane Charbonnier, other cartoonists, economist Bernard Maris and two police officers. Several others were injured as well. The heinous attack, which has provoked free speech rallying around the world, was the result of Charlie Hebdo’s offensive treatment of Muhammad in previous cartoons. An event-filled manhunt eventually led to the Kouachi brothers’ being shot down, concluding a hostage situation. One person who probably won’t think too much of The Simpsons’ alignment with the satirical magazine is Bernard Holtrop, a Charlie Hebdo cartoonist who was missing from the office that day because he hates going to meetings. Holtrop recently told the Dutch publication de Volkskrant that this big show of worldwide solidarity is a joke to him. Here’s his expectedly thrashy words. He did say that defense of free speech is a good thing in any form, however. Even when it comes at the end of a Fox animated comedy? I should say so.